The National University of Ireland held a Seminar on 5 December 2017 in the College of Anaesthetists of Ireland to showcase the research of former NUI Dr Garret FitzGerald Post-Doctoral Fellow, Dr Aline Courtois entitled “The Significance of International Student Mobility in Students’ Strategies at Third Level in Ireland” . 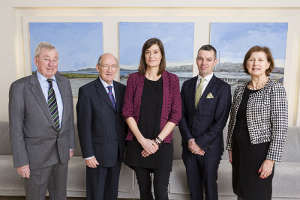 The research discussion was followed by the official launch of the annual NUI Awards Scheme. Dr Aline Courtois presented the key findings from her study on the experiences of Irish students studying abroad. The study found that outgoing student mobility brings a number of benefits at individual, institutional, regional and national levels and the majority of students reported having a positive experience. However, Dr Courtois’s research found that many students reported differing views on the “quality” – particularly the academic quality – of their time spent abroad. There were significant findings on such factors as the levels of institutional support available to outgoing students, and the cost barriers of an additional year abroad as part of a degree. Programme. 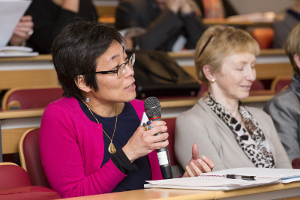 NUI Chancellor Dr Maurice Manning commented that Aline’s research provides valuable insights and that the publication is both timely and beneficial to those working in the fields of international education and languages and within nternational student offices. In particular he drew attention to the recent launch of a new Foreign Languages Strategy by Minister for Education and Skills, Richard Bruton, T.D., of which one goal is to increase the number of participants in the Erasmus+ programme by 50%. Professor Patrick Clancy, Emeritus Professor of Sociology at University College Dublin gave a response to Dr Courtois’s presentation saying, “The objective of making available the study abroad option to an even greater number of students in a climate of severely restricted funding is a real policy dilemma. What this study demonstrates is that there is a real danger of achieving an unsatisfactory trade-off between quantity and quality”. A lively Q & A session ensued with Seminar attendees from a variety of areas, including staff representatives in international education and language studies, representatives from the Higher Education Authority and the Irish Universities Association as well as past NUI Awards recipients. A video recording of the presentation, response and discussion will be made available on the NUI website shortly. 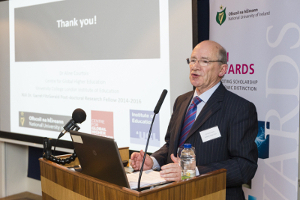 The NUI Chancellor Dr Maurice Manning led an official launch of the 2018 NUI Awards Scheme. 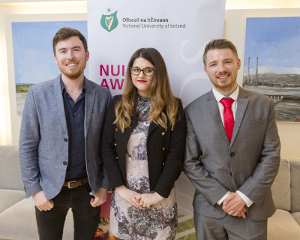 NUI grants awards and scholarships to the value of up to €1 million each year to its students, graduates and institutions. The 2018 NUI Awards Booklet, which was distributed at the launch, showcases a range of undergraduate and graduate level scholarships and awards to be offered to students and graduates of NUI member institutions in 2018. Dr Manning highlighted of some of the 2018 Awards including the NUI Post-Doctoral Fellowship in Humanities and the NUI E J Phelan Fellowship for an NUI graduate undertaking a PhD in International Law. Aoife’s dissertation was entitled, ‘Modern Homes?’ An Analysis of Irish and British women authors’ literary constructions of domestic space, 1929-1946 and analyses literary configurations of home with a particular focus on the works of Elizabeth Bowen, Daphne du Maurier, Nancy Mitford, Kate O’Brien, and Evadne Price. Aoife recently completed her PhD at the Faculty of English at the University of Cambridge, where she was a member of St. John’s College. Aoife, who is a UCD graduate, is currently writing a book on Daphne du Maurier for the Key Popular Women Writers series. She is also a Fellow of the Harry Ransom Center at the University of Texas, Austin. Gene undertook his PhD in the School of Law at Maynooth University under the supervision of Dr John Reynolds, who is himself a former recipient of the E J Phelan Fellowship. Gene recently completed his doctoral research, which looked at the relationship between international law and the design of sustainable peace agreements. Gene is a graduate of Maynooth University and is currently lecturing in European Human Rights, Asylum Law and Contract Law at Dublin Institute of Technology. Robert’s research focuses on axonal transport deficits in Charcot-Marie-Tooth disease (CMT), which is one of those most common inherited neurological disorders. The disease is named for the three physicians who first identified it. His research focuses on molecular interactions between Schwann cells and neurons, with the aim to recapitulate the pathogenic mechanisms in CMT using mouse models, as well as human induced pluripotent stem cells. He is currently in the third year of his PhD at the KU Leuven, Belgium and is a graduate of both Maynooth University and NUI Galway. 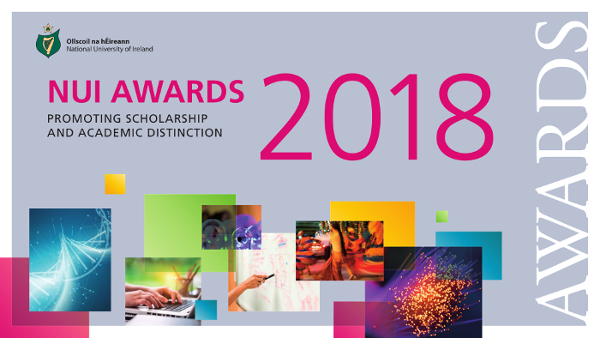 The 2018 NUI Awards Scheme will open for applications in January 2018 and updated application forms and regulations will be available at www.nui.ie/awards at that time.